Evidently, part of this blog’s mission is to bring you weird wonderful bits of history that you may not have learned about in school. Paul Revere’s midnight dash, Mrs. O’Leary’s pyromaniac cow, and Boston’s tea party? The U.S. Department of Education handled those. 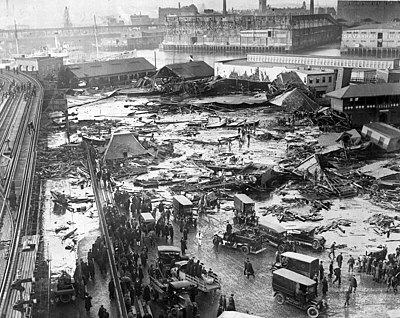 The Dionne quintuplets, the Collyer brothers, and Boston’s deadly wall of molasses (see below)? I’ve got you covered. Next Sunday marks the 100th anniversary of the sinking of the Titanic, and there is no shortage of tributes taking place this week, on television, in magazines, and on the internet – James Cameron even re-released his epic movie in 3-D. I have nothing useful to add to the Titanic lexicon. Sorry. But I can give you a recap of a lesser-known (okay, just lesser) tragedy that occurred 7 years after the Titanic sank. Thanks to the book project I’m working on, I’m elbow-deep in early 20th-century research. I’ve established correspondence with the U.S. Historical Climatology Network, and the National Railroad Historical Society. I can tell you what the temperature was in New York City on July 5, 1911 (97 degrees), or in Aberdeen, SD on January 12, 1912 (-46 degrees.) If you happen to bring up outhouses or whooping cough or the physiology of drowning, I can now contribute to the conversation. So I was even-more-than-usually interested when my oldest brother, who loves to torment me, sent me an article about a bizarre event that happened on January 15, 1919, in Massachusetts, just a couple of months after the official end of World War I. Sometime during that January afternoon, an enormous tank on the north side of Boston collapsed, sending a 15-foot high wall of sludge racing through the city, faster than a human could run. In the end, 21 people were killed and 150 were injured. What did the sludge happen to be? More than 2 million gallons of molasses. I don’t mean to be flippant – this was a terrible tragedy. But just imagine, for a moment, that you’re a Bostonian who is having a bad day. Your wife burned the breakfast porridge, the ignition switch on your Model T wouldn’t crank, you stepped into a puddle on the way to work and got your spats wet – and you have that timeless thought: Well, what else could possibly go wrong today? I can guarantee you that your first guess would not be, I’ll bet a giant wall of molasses is going to overtake me this afternoon, when I step out for a sandwich. Just my luck. By the way, if you’re wondering (and you should be) why the good people of Boston needed such an enormous quantity of molasses, there were several uses for it, back then. It was fermented to produce alcohol, which was used for drinking but also, in its ethyl form, for making ammunition (and remember, the first World War had just ended.) Molasses was also used as a sweetener, and, as my Grandma well remembers, it was mixed with sulfur and given to children each Spring, as a tonic, to “cleanse the blood” after sedentary winters. Still, in the category of Weirdest Flood Ever? My money’s on the molasses. If you want to know more about this event (and who wouldn’t? ), here is an interesting and well-written article from the Smithsonian. I learned more than I wanted to about the physiology of drowning while reading Junger’s “The Perfect Storm.” My sympathies to you. I also have just discovered while reading McCullough’s “John Adams” that Boston and ammunition have had a fundamentally important association with each other since at least the 1770s. This is why we get along so well, J. SO, I’m wondering how those people would feel when someone from the South says, “He’s slower than molasses”. Molasses wasn’t slow that day, apparently. Crazy post, but very interesting! I love your writing but mostly because I can totally see you telling the story. Love it!! Good point: can you imagine just HOW MUCH of it there must have been, in order for it to overtake people? how’d they clean it off the streets? how many cats fell victim to the goo?